The project’s main objective is the study and development of robust self-healing coating systems for the long term durable protection of existing metal structures, as well as replacement elements, in architectural renovation projects. Metals are and have been widely used for many decades in building & construction world-wide. They are selected for their outstanding mechanical properties providing strength and stability to the structures, as well as for their functional properties such as their appearance. The main drawback of metals is their susceptibility to corrosion. Past and current metal protection systems against corrosion are following the ‘damage prevention’ concept: coatings are applied on the metal with a high initial performance, but – when damaged- they are unable to repair and consequently fail to adequately further protect the structure. What we propose follows the innovative ‘damage management’ concept: the coatings contain autonomous self-healing mechanisms to repair surface defects and as such restore the initial properties of the structure even after multiple damage events. The self-healing coatings will contain ‘green’ eco-friendly corrosion inhibitors for immediate passivation in the event of a defect exposing the underlying metal, combined with autonomous repair of the polymeric matrix coating. 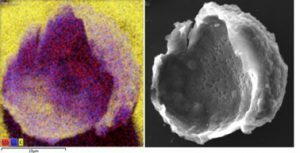 Microcapsules with variable mechanical properties have been synthesized containing single reactive healing agents that can polymerize autonomously when the capsules break during a damage event of the coating. The design of the different capsules is conceived to heal different types of damages. Additionally encapsulated corrosion inhibitors are incorporated in the coatings. A methodology to study the healing of the system has been established. Using various electrochemical as well as standard corrosion tests it was shown that the healing elements can protect the underlying metal against corrosion when the coating is damaged. The concept of the autonomous healing coating has been demonstrated. 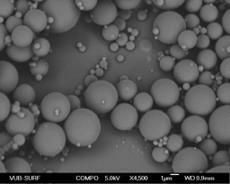 Figure 2: FEG-SEM picture of spherical PU microcapsules containing IPDI as single reactive polymer healing agent; capsules with a size of several µm were synthesized using various synthesis procedures to vary the mechanical properties. Figure 3: Elemental EDS mapping (left) and FEG-SEM image (right) of a broken PU capsule containing Na2MO4 as corrosion inhibitor, showing that the inhibitor was inside the hollow capsule. Yellow indicates carbon while red and blue indicate sodium and molybdenum, respectively. Figure 4: Electrochemical local analysis using SVET mapping of low carbon steel coated with a polyurethane coating without corrosion inhibitor capsules (top series) and with capsules containing Na₂MoO₄ (bottom series). The current density mappings show strong anodic (red areas) and cathodic (bleu areas) activity in the defect in the PU coating without corrosion inhibitors (top series), while the defect in the coating containing the encapsulated inhibitor remains much more passive (bottom series).